and Georgenberg, a long blooming plant with bright orange blossoms. 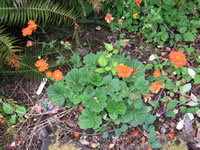 Geums are also commonly known as Avens plants. They form 16"-18" tall, spreading mounds of evergreen, coarsly textured, dark green leaves. solitary, 1"-1¾" flowers or small clusters of smaller, brightly colored flowers. 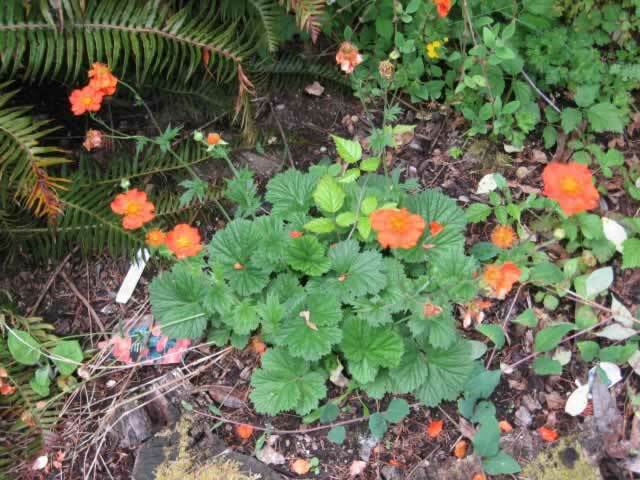 Geums are excellent plants for border plantings, rock gardens, and for growing in containers. These plants are a 'must have' for your Butterfly Garden. but some shade in the heat of the day. Set plants 12"-18" apart in fertile, well drained soil. Water thoroughly but allow soil to dry slightly between waterings. Apply a balanced fertilizer once in the spring, when new growth begins. Deadhead regularly to encourage continued blooming. Remove any dead leaves as they occur. Geums can be pruned back hard after blooming to rejuvenate the foliage. 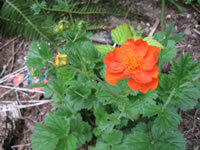 Sow Geum seeds directly in the garden in the spring or summer, up until 2 months before the first killing frost. Seeds can be started indoors 6-8 weeks before the last killing frost. Germination will take from 21 to 28 days.